Southern California has received so much rainfall lately, some people have decided to make the best of it. 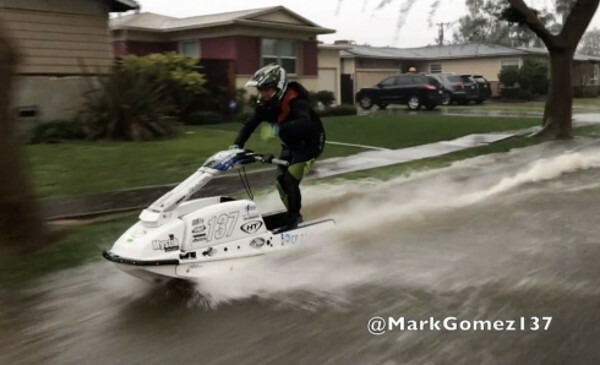 When a jet skier in Fullerton got the brilliant idea to ride up a flooded street like a salmon running upstream, the result was glorious. Mark Gomez posted the following video to his Instagram taken during heavy rainfall on Sunday. Gomez wrote that he and his brother just happened to be home on the same weekend when the stars aligned and flooded the gutters enough to ride a jet ski. “On this stormy Sunday this little 550 screamed up this little 8 inch Yale street gutter river like an angry race gas burning salmon up stream! !” Gomez wrote. On this stormy Sunday this little 550 screamed up this little 8 inch Yale street gutter river like an angry race gas burning salmon up stream!! After years of my brother Philip Gomez and I waiting for the rainy day stars to align. That was for us both being home and it to be raining just hard enough to get our street gutters to flood enough so I could try to ride up our street in Fullerton, CA. We tried it before but couldn’t get it going..today with the help of the neighborhood I pulled it off! First attempt was filmed from the bottom of the hill, I made it all the way up my street, turned right and had to stop because of a parked car blocking my river! This second attempt got almost as far until I clipped the curb which sent me into the shallow spot toward a soft abrupt stop, but thankfully my chin cushioned the blow haha. Such a rad home experience. #bucketlist #liverideescape #Jetski #Fullerton #kawasaki550 @mystiklubes @worxracing @Hydroturf @dasaracing @tcfreeride @liquidmilitia @jetpilotcompany @bombereyewear @skattrak @jet.renu @700pirate #rickter #ESUArmor @salty_investments #factoryzero #hotproducts #coldfusion #kmgracing #performancefiberglass * Jukin Media Verified * Find this video and others like it by visiting https://www.jukinmedia.com/licensing/view/949259 For licensing / permission to use, please email licensing(at)jukinmedia(dot)com.